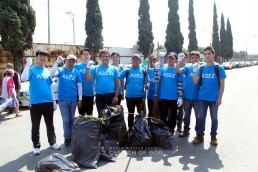 On July 31, 2017, ASEZ carried out a street cleanup in Lenguas Indígenas Street and at a sports and recreation center called Centro Social y Deportivo Zapata Vela located in Mexico City, Mexico. This event was co-hosted by the Department of City Service of Iztacalco Borough Office and was participated by the ASEZ branches of Korea and of Mexico and officials from the borough office, about 70 in total. As the Centro is used by a lot of citizens of Mexico City, there was much trash in the street leading to the Centro and inside the center. The volunteers cleaned even inside the bush though the trash was not seen from outside the bush, and cleaned up even little pieces of plastic bags. They set up a booth to advertise the environmental protection to the residents so that this activity wouldn’t end as a one-time event, and encouraged the residents to participate in the activity by introducing the previous activities of the ASEZ. The residents showed positive response, promising to work with them for the future events.